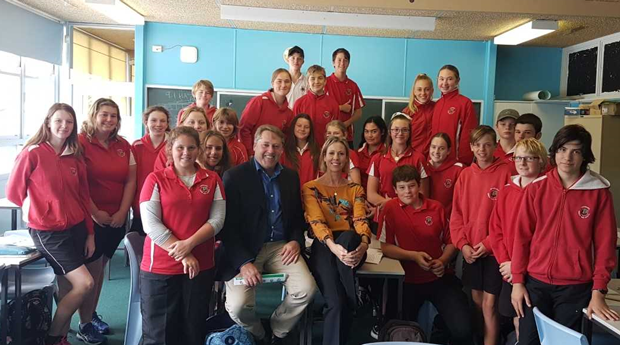 Teacher Renee Passell writes: As part of the Year 9 Civics course students learn ways to be an active citizen. This involves first learning how our Legal and Political system operates and then how they play a vital role in that system. Part of this journey involved finding out who represents us in the Federal and State parliaments and then the ways we could contact them if we had concerns, wanted an issue raised or needed information. Students emailed Rick Wilson and invited him into our class so they could ask him questions about issues that concerned them. There were other topics also such as manufacturing in Australia and Abortion laws. The students prepared 3 questions about their issue and a topic that concerned youth in regional towns and typed them up before his visit. On the day he stayed for 45 minutes and answered a variety of questions from all of the class that were very good questions. After he left we analysed his answers and voted on how well he answered each question - based on the facts they had gathered. I was very proud of the class.